11x17, xv + 130 pp. 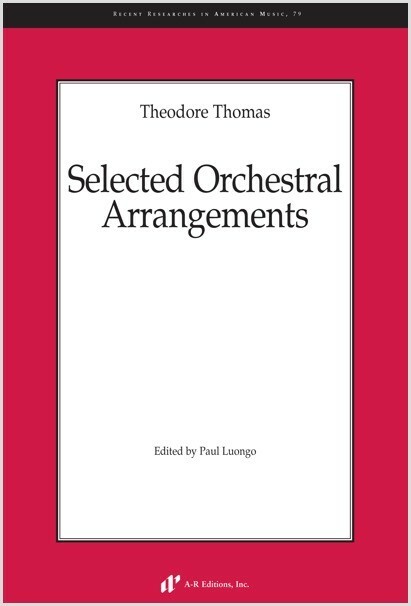 This collection presents a selection of popular and historically significant arrangements by famed orchestral conductor Theodore Thomas (1835–1905). Thomas was among the most influential figures in the development of the American orchestra. Through approximately three decades of touring with his orchestra across the country, and in the process laying foundations for the Chicago Symphony Orchestra, Thomas left an indelible imprint on the American musical landscape. His arrangements were integral to his popularity with American audiences, who wanted accessibility in their music yet sought validation of their cultural sophistication. By presenting carefully chosen works of Europe’s most venerable composers in his arrangements, Thomas found a formula by which he could entertain his audiences while nevertheless encouraging their aspiration toward the status of high culture. These works span the entirety of Thomas’s career, from the less assuming (although wildly popular) early arrangement of Schumann’s “Träumerei” to the weighty mature arrangement of Chopin’s Polonaise, Op. 53. Rental orchestral parts are in preparation.